Movie database app IMBb has been updated to version 3.3, adding support for movie ticket purchases directly within the app for customers located in the United States. The upgrade also includes integration with the Amazon Mobile app, allowing users to buy a movie or TV show on DVD or Blu-ray that they have viewed in the IMDb app with the tap of a button. Additional celebrity bios have been added, along with a number of bug fixes. The iPhone version of the app will now offer one tap access to full cast and filmography details from movie and celebrity pages, and Watchlist functionality has also been improved. - "Tickets, please!" 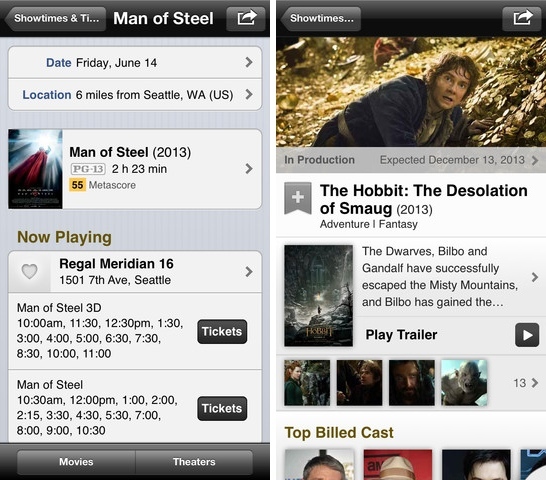 You can now conveniently purchase movie tickets via the IMDb App (currently US-only). - More bios for celebrities you know and love as well as for up-and-comers. - Want to buy a movie or TV show on DVD or Blu-ray? “Search via Amazon Mobile” to the rescue. Requires that you have the Amazon Mobile app, but we provide a handy link if you don't have it yet. - Also, did you know you can tap the "Coming Soon" bar above the title on upcoming movies to add the release date as an event to your calendar? - Bug fixes. Nasty tricksy bugsies. We hates them! - We heard you. By popular demand, we've updated the movie and celebrity pages to include one-tap access to the full cast/full filmography (which, yes, scrolls vertically). - You'll see that cute little Watchlist flag almost everywhere now. Tap it to add movies and shows to your Watchlist (and tap-and-hold to add to your other lists as well). Is there the same transaction fee of $1+ per ticket for the "convenience" when buying movie tickets? I'm just estatic it no longer crashes automatically for iOS 7 users (or at least it doesn't for me). Now seems to work correctly on iOS 7. Yes! I was so excited about this. I use this app all the time and using it in Safari just wasn't good enough. So does Apple get their 30% cut on this?